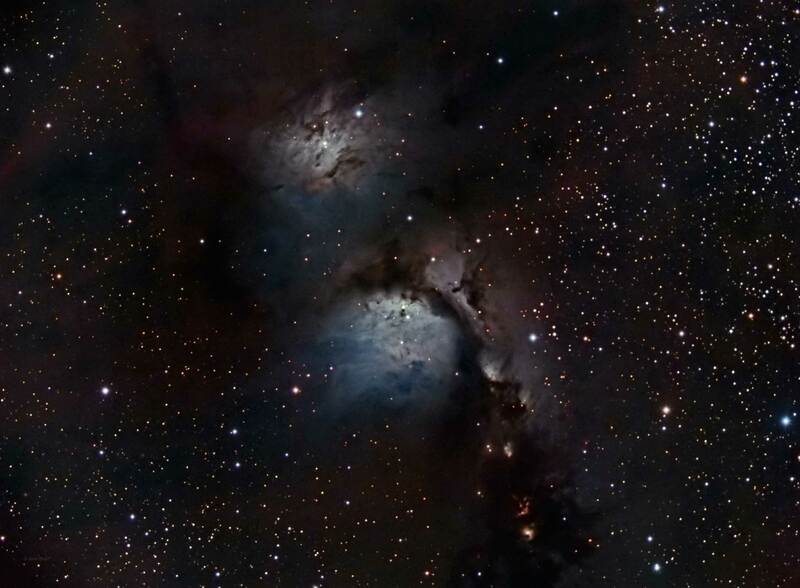 Messier 78 is a reflection nebula in the constellation Orion. It is the larger of the two reflection nebula in my image. The smaller reflection nebula above M78 is NGC 2071. There is a lot of dust in this region that hides the young hot stars that are forming in this area. Both Messier 78 and NGC 2071 are the result of these young stars blasting away the surrounding gas and dust creating a vast void in the surrounding dust. Eventually these two reflection nebula will join as one larger nebula as the surrounding dust is ejected by new star formation. There are approximately 192 newly discovered stars and 45 T Tauri stars in Messier 78. T Tauri stars are proto stars that have not started the fusion process. There are 21 Herbig-Haro objects in this region and several are seen in my image. The HH objects are narrow jets of ejected gas from newly formed stars that collide with surrounding gas and dust. They appear as a reddish jet set against the dark dusty background. There is also an unusual nebula that has appeared in recent photographs that was not present before. McNeil’s Nebula was recently discovered and appears and disappears at times. It is visible in my image as a fan shaped object below M78 in the top portion of the dust cloud just to the right of two side by side stars. This image was captured at a fairly dark site in the high desert but there was a constant wind of 10mph with gusts up to 25mph. I was there for two nights but only used about one nights worth of images. There were a lot of images with bloated and/or slightly elongated stars that I had to toss.